With KITS Digital IP Surveillance / CCTV solutions, airports, rail terminals, government buildings, offices, retail sites, financial institutions, parking garages, Hotels / restaurants and homes security concerns has become a thing of the past. Our solution is sophisticated and available in both analogue / IP based. You will be able to monitor without boundaries and keep record of all activities (video and audio) as you may desire. Our technology is robust. We create innovative and effective security solutions for the protection of human, environment and valuable assets. We deliver real value and operational benefits to our clients, on an enterprise wide scale. We combine the potentials of Digital IP and analogue technology in offering unsurpassed flexibility, connectivity and extreme manageability allowing centralised management and control of security systems across the surveillance network, and dramatically reducing the number of security and monitoring staff required on site, whilst at the same time improving the quality and quantity of security systems in place. KITS technologies surveillance team will design, install and support your video surveillance plan to meet your requirement in line with the most modern surveillance technology and to the industry best practices and standards. Are you thinking of implementing human, assets or environmental surveillance? Do you have an existing “old” CCTV system that you want to upgrade to digital or expand? Are you ready to simplify your deployments with a single digital platform? 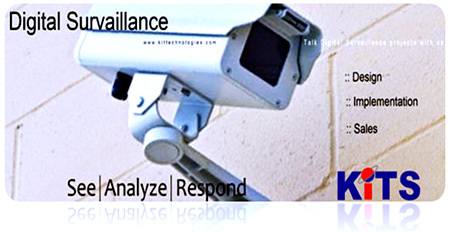 Whatever may be your video surveillance needs and requirement, KITS technologies has a solution for you. We provide wide range of Surveillance solutions; we will work with you to identify the appropriate configuration for your specific requirement and environment. All installations will be done professionally and we will educate you on how best to administer and maintain your surveillance system in a way to maximize the value of your investment.